Alliance Property Management manages residential and commercial properties. This includes single family homes, townhomes, condominiums, duplexes, fourplexes and larger, (multi unit buildings), apartment buildings, retail strip centers, office buildings and industrial buildings. 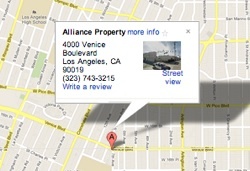 Alliance Property Management services Los Angeles; from Downtown to Santa Monica. Why choose Alliance as your Property Management Company? Turning over your rental property to the care of an unknown property manager can be an emotional and frightening experience. That is why you want to choose a company with experience and the right hands on approach. Alliance Property Management has been in business for over 12 years, and employees service professionals who together have over 40 years of experience managing properties. It was the management of our own real estate holdings that led to the creation of Alliance Property Management. We pride ourselves on being educated on housing regulations and California Property Law. There are a multitude of applicable laws related to rental property, leases, and rent control for different cities. You need an educated firm to handle all the different property laws that come with renting out your property. Why deal with it yourself and hold the responsibility, let us carry the burden for you. What will you do to rent my vacancy? Internet Listings – Westside Rentals, Craig’s List, Trulia, Hotpad, and more.